Uhhh what is even going on here. Ex-basketball star Dennis Rodman, who until Monday’s in-person negotiations between President Donald Trump and North Korean strongman Kim Jong Un could accurately claim himself to be one of the few people friends with both, crashed the closed-door event today in Singapore. He did so wearing a shirt advertising a marijuana-themed cryptocurrency startup that now seems destined for either a museum or, if we’re gonna guess, a jaw-dropping high bid on eBay. 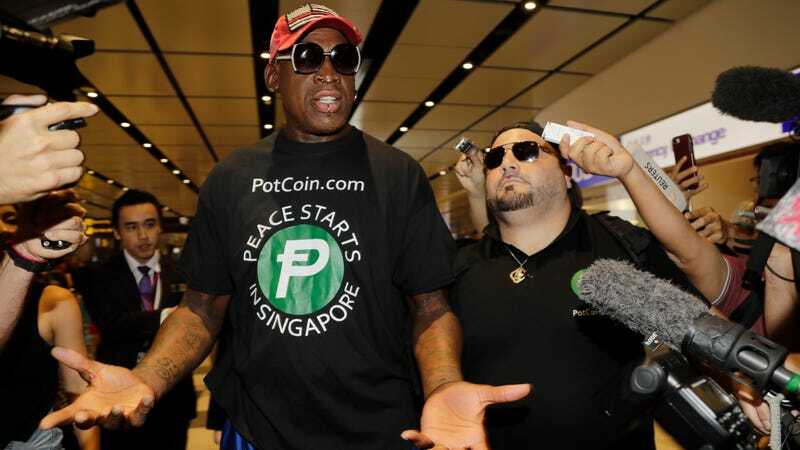 Sporting a t-shirt promoting a marijuana-related cryptocurrency company, a red “Make America Great Again” hat, and a large nose ring, Rodman spoke to CNN live from Singapore. Though he wasn’t actually invited to attend the summit, he flew there anyway — on a trip sponsored by PotCoin, the cryptocurrency business. While this was undoubtedly a fantastic day overall for PotCoin, which sponsored a previous trip by Rodman to North Korea in 2017 and saw its prices skyrocket as a result, the outlook for the summit itself is not so clear. Both Kim and Trump appeared amicable at the “carefully choreographed” event, according to the New York Times, though it was not clear that they would agree on the meaning of terms like “denuclearization” intended to be included in a joint statement. In the initial phases of the summit, per CNN, Kim did not answer when asked if he intended to give up North Korea’s arsenal of nuclear weapons.